Many say that Syracuse is just an average college town, but with much more snow. There is at least one person out to change that perception (besides my mom, champion of the Near West Side) and his name is Michael John Heagerty, voted Best Community Advocate in 2016’s Best of Syracuse, run by our local community publication the Syracuse New Times. Last week I was once again at #overpassfest. 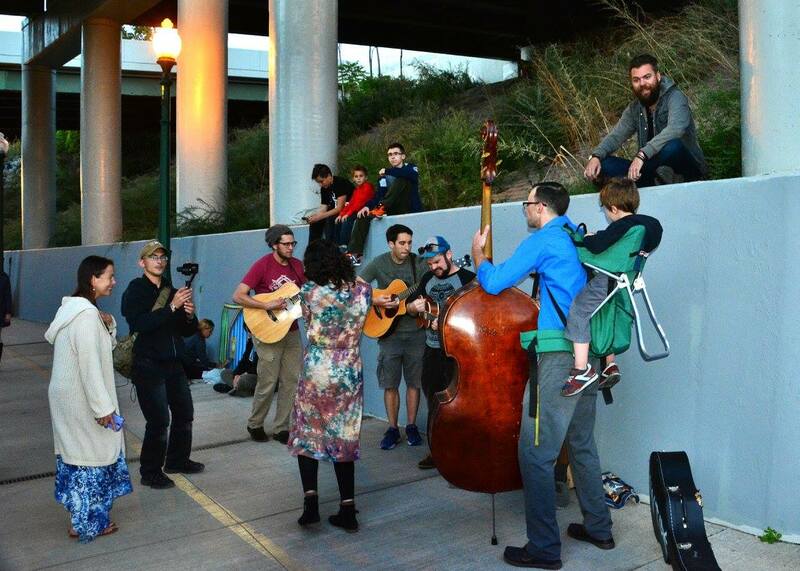 It’s an informal gathering of artists and musicians that has been happening every week since June. So far there have been #overpassfests at the Onondaga Creekwalk, the Inner Harbor, the Erie Canal Museum, and at the Great New York State Fair, and each one has been unique and amazing. Musicians with guitars, basses, tambourines, trombones, and even a couple of cajons (a percussion box that you can sit on and play at the same time) show up at the designated place at the appointed time and just start to perform. The groups constantly change as the evening goes on. Add in photographers (like my friend Lisa Kane), artists of all sorts of media, and for at least one week, a guy with a typewriter that wrote poems on demand. Every week people gather and create together in a community space that otherwise doesn’t see a lot of action.